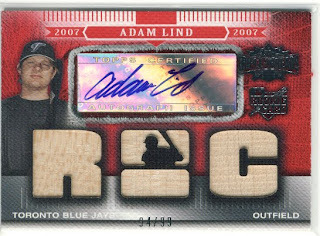 The other day at the card shop my friend Dan brought his Adam Lind collection with him for me to check out. I'll admit it was almost like flipping through my own with the exception of 10 or so cards. What can I say, we have good taste. Dan had doubles of 3 cards that I needed, and he let me take them for cards to be named later. Hooray! It made my trip even more fun. Oh.... what's that? You want to see what I looted from Dan's PC? Ok, ok settle down folks. I have been trying to get my mitts on one of these cards for-ev-er. Yay! This was fun because the card looks like it has a watch on the side, at least to me it does. Welcome home, Adam(s). You'll be very happy here with many just like you floating around. Thanks for the loan, Woodpecker. Dan collects some Mets (not all, he hates some of them as much as I do), Jay Bruce , David Wright , Adam Lind , Scott Rolen , and Sox prospect Anthony Rizzo (there may be more but I don't remember). 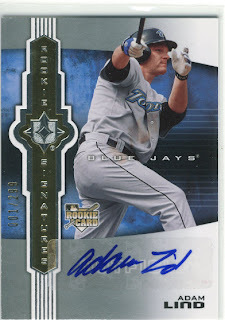 If you have anything you want to flip of those guys, please let me know (specifically 2010 Heritage Jay Bruce auto). here's a funny story for you guys and you're gonna laugh.... Dan must've been the one who bought my Adam Lind collection off of Ebay (http://cgi.ebay.com/ws/eBayISAPI.dll?ViewItem&item=320532985177&ssPageName=ADME:L:EOISSA:US:1123). My mother is trying to get started on ebay (lucywills25) but she has hardly nothing to sell so it's actually my stuff that I'm selling under her. 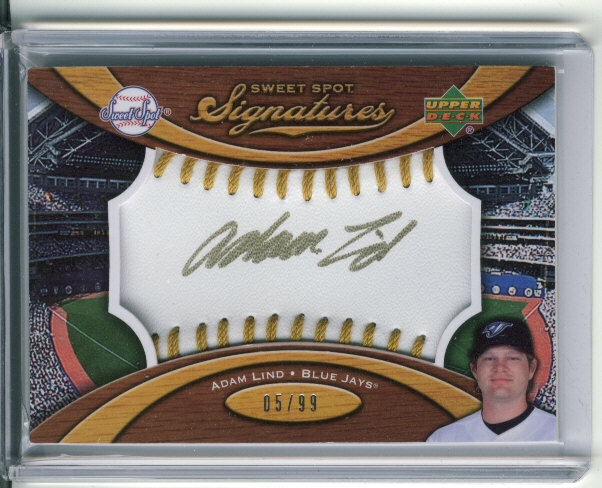 I had that Ultimate 1/299 because if you check my Adam Lind collection....you would see it in there. I sold the cards also because when you're a single parent with two kids and when there's not enough money to take care of all of the expenses...you make sacrifices for your children. Mine just happen to be my collection. BTW.....Dan never left any feedback!